This study analyses the temporal and spatial distributions of droughts and floods in northern China during the Qing Dynasty (1636–1912), with data ranging from 1644 to 1911, or nearly the entire dynastic period. Variations in the intensities of droughts and floods are investigated across different timescales and with respect to their spatial variation. The impacts and physical mechanisms of solar activity as well as surface temperatures of the Pacific Ocean on drought and flood intensities in northern China are analysed using a cross-wavelet method. The results reveal periodicities on scales of 10–11, 20–22, 45–50 and 90–100 yrs. Seven rapid changes are found on the 10-yr scale and four are found on the 30-yr scale. Analysing the spatial distribution of drought and flood intensities, we found a trend of decreasing precipitation from east to west. Precipitation over the Shandong region, which is in the eastern part of the study area, is significantly higher than that of the other regions, which may be explained by its coastal location and the resultant rich water vapour content of the atmosphere. 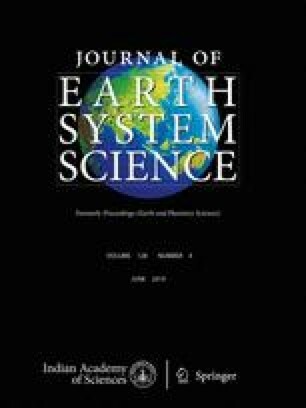 Analyses of cross-wavelet power spectra and coherence spectra among the different drought and flood intensities and the Niño3 regional sea surface temperature (SST) index series and sunspot series indicate significant correlations between the drought and flood series and the Niño3 SST index series at scales of 2–4 and 8–12 yrs, and the phase difference differs across the different timescales. Furthermore, the drought and flood series and the sunspot series are closely correlated at a scale of 8–14 yrs. This work was funded by the National Natural Science Foundation of China (Grant Nos. 41271410 and 41071253). We are grateful to the reviewers for their valuable comments that helped to improve the quality of this paper. Scafetta N 2010 Climate change and its causes, a discussion about some key issues; arXiv preprint arXiv:1003.1554v1, pp. 70–75.